Exceptional Quality at a GREAT Price!!! Making possibilities a reality is why Stonehenge Aqua came to be. Watercolor is all about possibilities. Because it’s not just about beautiful paint. There’s another factor: a wonderfully, whimsical element – water. Together, they allow for form and flow, chaos and connection, beauty and structure. 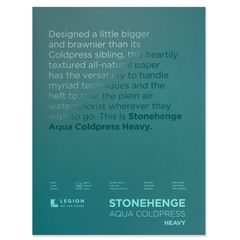 Aqua Stonehenge is as finely crafted as it is affordable. Performing way beyond its price point, it has been tested to its limits and as it turns out, it has no limits. Wet-on-wet or wet-on-dry, it has a wonderful crispness that anchors beautiful work across every task and technique. With Stonehenge Aqua, blending is effortless, lifting is no longer a chore. It welcomes masking while never relinquishing the control you both demand and desire. Bright colors dry bright. Blocks or sheets, it’s flat paper that dries flat. 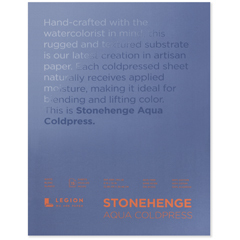 Cold Press or Hot Press, Stonehenge Aqua is everything an expensive paper is without the expense. Because every artist deserves every possibility. 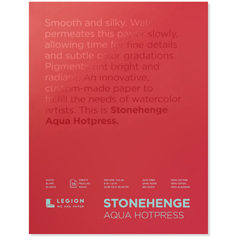 Stonehenge Aqua Watercolour Paper is also available in a gummed-bound block. 140lb. 100% cotton. 15 sheets/block.